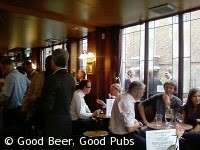 On Wednesday evening Jon and I had a bit of a crawl around pubs close to St James’s Park tube station. It’s not an area that either of us were familiar with but it yielded a superb pub that we shall definitely be returning too soon. 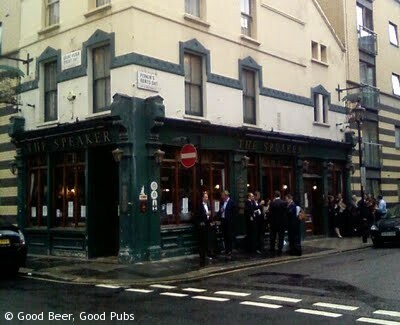 The Speaker is in Great Peter Street – away from the bustle of Victoria Street. You know when you’ve found a good pub when there are crowds of people standing outside on the pavement even when it’s raining – think of the Market Porter in Borough Market. Getting to the bar was a bit of a struggle because of the number of people inside. We started off with a couple of pints of Colley’s Dog from the Tring Brewery . This was a delicious dark and malty beer. After some very reasonably priced sandwiches we then tried the Meantime LPA, a refreshing hoppy beer and very moreish. Jon and I left the Speaker for a while to visit the Abbey up the road but decided to return to the Speaker to finish off the evening. The Speaker is definitely worth a visit if you’re in the area – it’s a great place for a conversation as there’s no music or TV unlike other pubs we visited during the evening. 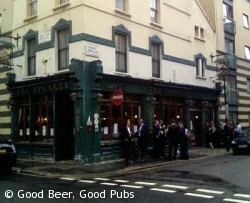 I’ll post details about the other pubs we visited soon. The Speaker's a great pub, if perhaps an acquired taste. Mild sarcasm from the staff, lots of passive-aggressive signs… classic real ale pub stuff! Jon and I are planning a trip to the Speaker's festival on Wednesday 26th August in the evening.